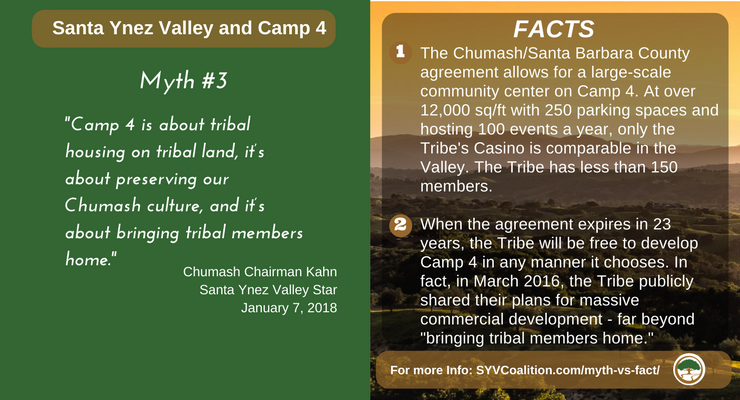 In the next of the myth vs facts series, the assertion that Chumash development of Camp 4 is only related to addressing tribal housing and community center needs. The Chumash/Santa Barbara County agreement allows for a large-scale community center on Camp 4. At over 12,000 sq/ft with 250 parking spaces and hosting 100 events a year, only the Tribe’s Casino is comparable in the Valley. The Tribe has less than 150 members.